Saturday, March 16: Spring Scratchboard Drawings Learn how to create your own scratchboard by layering wax crayon and thin layers of paint. 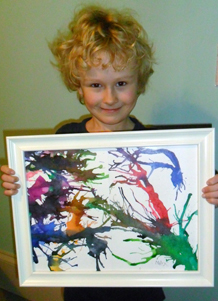 Using bright and fresh colours we will learn how to create spring-inspired drawings using the cool techniques of scratching away the surface to reveal the coloured wax underneath. 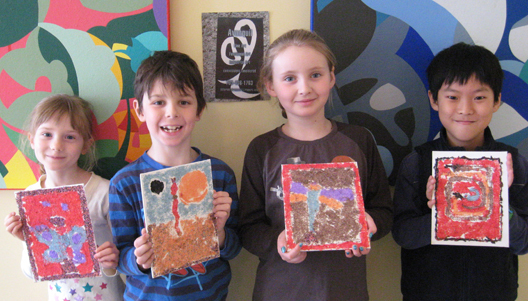 Saturday, April 6: Pattern Paintings on Canvas–DOTS! We will be inspired by bold Australian dot paintings to create our own patterns and dot designs on canvas using bright colours and our hand as a starting point. Saturday, April 20: Doodled Easter Eggs Get out your Sharpies! It is doodle time! During this workshop we will transform reusable Easter Eggs into mini masterpieces! Each Easter egg will be unique and colourful- covered in doodles, cartoons, patterns, shapes and more. By the end of the workshop each child will have a mini basket of funky eggs to give away to family and friends or to decorate their house for Easter! Tuesday, April 2: Pattern Paintings on Canvas–DOTS! 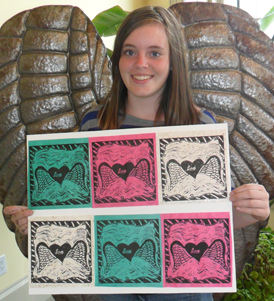 For ages 12-16 (held from 5:30-6:30) $20 plus HST per student (which includes all supplies). This group is a place to experiment with the media of your own choosing including drawing, pen and ink, watercolour, acrylic painting on canvas, chalk pastel, oil pastel and more in a friendly and creative environment! Check out our Testimonials webpage. Thank you SO much for all your great feedback! Don’t forget to LIKE us on Facebook to get updates and postings about all things creative in Northumberland! 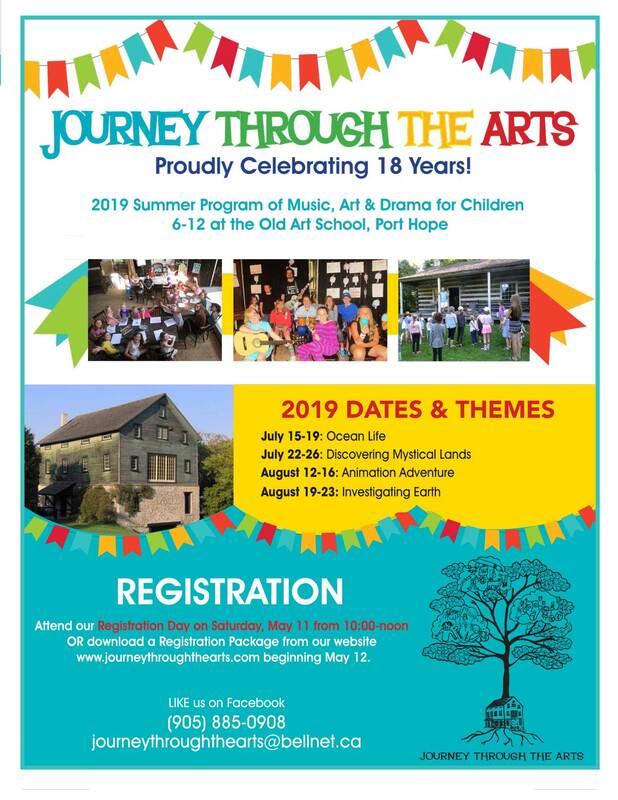 Journey Through the Arts, run by artist Christine Benson, and musician Mike Woods is a multi-faceted arts organization in Port Hope, Ontario which is dedicated to bringing a variety of exciting programmes to adults and children. 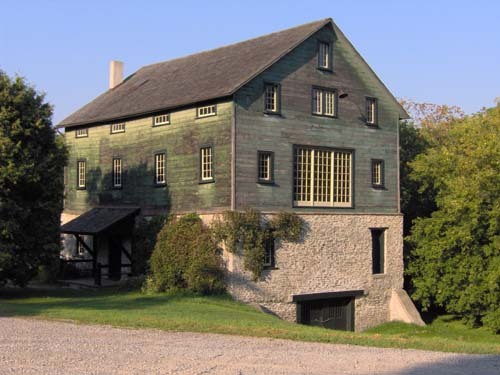 Founded as a way to ensure "the arts" (music, art and drama) are an integeral part of children's lives JTTA offers week long summer programmes throughout July and August at a restored mill along the Ganaraska River. The summer programme, which was founded in 2002, teaches children (between the ages of 6 and 13) about the value and importance of using their creativity and imagination while they produce visual art, perform original musical compositions and perform short plays. The results are both inspiring and humbling as the children gain confidence and learn various skills throughout the week. From its roots as a children's arts organization Journey Through the Arts (JTTA) has blossomed and grown into a place where adults and children alike can experience the limitless possibilities of the arts. JTTA now offers after school, weekend and specialty art workshops for children, private guitar lessons, a group recording facility and adult visual art workshops which are dedicated to exposing adults (with various levels of experience) to the fine arts. 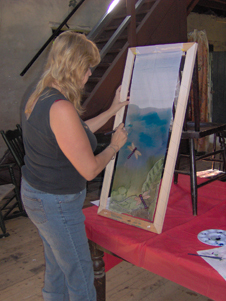 In the summer of 2005 JTTA opened the doors of the The Journey Through the Arts Gallery which focuses on giving exhibition opportunities to local and regional artists and artisans. The JTTA Gallery offers visitors a glimpse into the ideas, practises, techniques and work of 15 artists. The gallery features a variety of media including painting, printmaking, jewelry and pottery. Exhibitions and artists are ever-changing with work that is sure to inspire the artist within all of us. Arranged to suit your individual schedule, these lessons can be booked after school or in the evening. Lessons are 30 minutes ($20 per lesson) or 1 hour ($30 per lesson) plus HST. 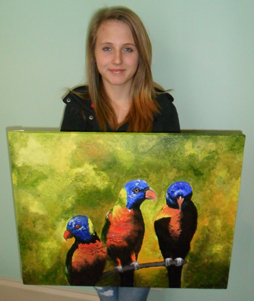 Private lessons include all art supplies. Lessons are based on your individual interests including mosaics, jewellery, painting on canvas, watercolour, printmaking and more!! JTTA offers a fun and creative way to celebrate your child's birthday! 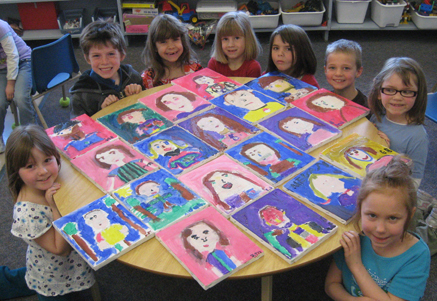 Your private party includes all supplies, snacks and an art project for each of your guests. Parties are one hour in length and are held at our downtown studios. 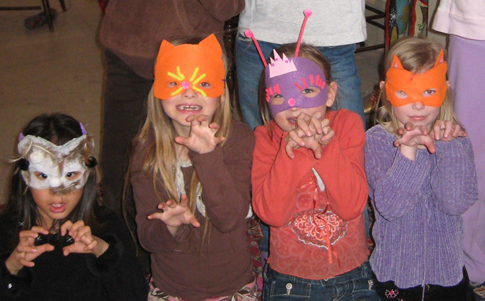 Parties are suitable for children 6-13 and are $15 per child plus HST. Please visit our website or call the studio for project descriptions. Invite JTTA to your school! 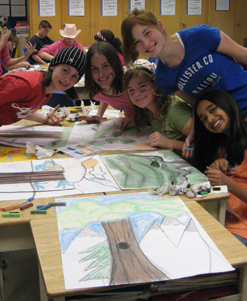 Workshops are available for JK to Grade 8 in various media. All workshops are affordably priced at $6 plus HST per student, including all art supplies. Instruction is 2 periods in length and comes with an accompanying rubric that compliments the visual art curriculum. Each 1 hour workshop focuses on a particular technique and/or art movement. Art workshops for children are held on Saturday’s from 10:00-11:00 and are $20 per workshop plus HST (which includes all art supplies) and consist of a maximum of 10 participants. Children are not required to register for all workshops and are free to pick and choose the workshops that interest them! Features guitar lessons, guitar supplies and an impressive private permanent collection of Rock and Roll artifacts. Visit www.northumberlandrockandrollexperience.com for more information!